Tech innovations regularly make headlines all over the world, and for good reason. With increasing pressure on countries to sustain growth, and with limited resources to go around, technology seems to be the gift that keeps on giving. That being said, in the last few years there have been a fair share of buzzwords going round – artificial intelligence, blockchain, augmented and virtual reality – each one promising to be the catalyst for the next industrial revolution. We’re still patiently waiting for these exciting techs to tip over from the early adopters into the majority, which they will without a doubt one day. One of them has been steadily entering into the mainstream though and is starting to deliver concrete proof of how it can transform the world around us. Of course you already know that it’s 3D printing, which is also referred to, or included in (depending on how you look at it), additive manufacturing. 3D printing is a truly disruptive technology in the sense that it changes the fundamental rules that have been governing the modern manufacturing industry, and the connector industry is no different. Let’s take a look at three of the most important changes it can bring. Manufacturing plants will know the pressure all too well. With customers expecting increasingly faster delivery times and a constant concern for efficiency coming from management, short lead-times are a top priority for all. If we take a traditional connector, composed of a metallic or composite shell, polymer insert and metallic contacts, production time for each one of these components is usually counted in weeks. The metal parts are machined and milled, the polymer is melted down and mold-injected, and the final assembly is manually done to ensure a strict quality control process. Each one of these processes is a complex one, with a risk of human error at each stage leading inevitably to rejects and scrap waste. Step in 3D printing. Once the engineer has modelled his part and uploaded the CAD into the printer, printing usually doesn’t take more than a few hours at most for large, complex objects. Furthermore, the printer can produce the entire polymer part in a single piece, reducing the need to assemble the components and saving significant amounts of time. All this can be done almost completely autonomously, with an operator needed only to inspect the pieces at intervals to ensure quality compliance. For some connectors that have lead times of 16 weeks or more, this type of technology will definitely be of interest. 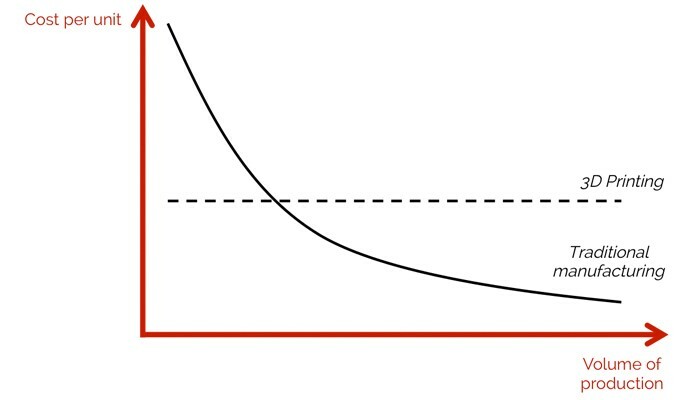 A foundation of modern microeconomics which every manufacturer should swear by: the higher quantity one produces, the lower the unit cost of each unit. Right? Wrong says 3D printing. And this is where it is truly disruptive. Modern manufacturing is based on production lines that are carefully planned to optimize processes. The setup costs of the line, not to mention the calibration of each machine, represent large fixed costs that need to be offset by large volumes produced. While one could argue that designing costs come into play, which is correct, overall the production costs for 3D printing do not change significantly depending on the quantities that are produced. If the manufacturer purchases polymer raw material in bulk, and has multiple CAD models ready, he can theoretically print 1 unit or 1000 units at the same cost per unit. That is precisely why 3D printing started off in the field of prototyping, for which it is particularly suitable. All that the manufacturer needs is a 3D model and the raw material to feed into the printer. This feature of 3D printing opens new business opportunities for manufacturers which were considered impossible before due to high fixed costs. Functional prototypes and small volume series become a cost-effective way to test a market without having to engage massive resources. Maintenance and replacements of discontinued series allow client-companies to avoid (temporarily) costly upgrades and overhauls of their systems. The costs of customized connectors for highly-specific applications can also be significantly reduced, as 3D printers hail a new era of mass-produced personalization. Although it seems like 3D printing is set to take over the world of manufacturing, if it were that simple, it would have already happened. If it hasn’t, it is because of limitations that have slowed down its entrance into the mainstream. In the case of connectors for harsh environments, the obvious one is the physical properties of the materials used. Harsh environments by definition expose materials to environmental pressures including extreme temperatures, vibrations, UV radiation, salt spray, corrosive elements and so on. For this reason, connector manufacturers have been using a wide range of materials and protective plating to enhance the mechanical and electrical properties of their products. These high-performance requirements currently do form a barrier for 3D printing to become widespread, but innovations and developments in the technology do show some promising signs. Metal 3D printing is starting to appear on the market with possibilities to use aluminum, stainless steel, titanium, cobalt-chrome, nickel alloys and more. Polymers that are commonly used in 3D printing also present high-performance developments with polycarbonate resisting temperatures of up to 120°C and having excellent durability, or PETG offering a high resistance to water immersion and aggressive chemicals. Esterline Connection Technologies – SOURIAU is currently testing 3D printed inserts that can be integrated into functional connectors and has developed prototypes using polycarbonate that resist extreme conditions. You can find out more and get involved in this groundbreaking project by visiting our 3D printed inserts page. 3D printing certainly has a number of other limitations and disadvantages which we will not list in detail in this article. Currently, the costs for 3D printers and raw materials are still high, and it is not going to replace all manufacturing processes any time soon. However it does offer a complementary set of benefits, and considering that the first 3D printer first appeared in the 1980’s, and really started gaining traction from industry in the 2010’s it is still a very new technology that is poised to revolutionize our industries. Beyond the case of connectors, the benefits of its development are not limited to industrial environments. Providing 3D printing access to the main market, whether it is in schools, universities, companies or even people’s homes gives everyone the chance to innovate and spark new engineering breakthroughs as the possibility to create absolutely any object imagined from scratch will permit users to translate ideas into products with the click of a button, making every inventor’s dreams come true.